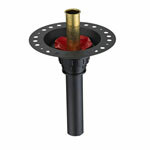 Height to base of spout 26-13/16"
The Darya 6636 tub features a factory installed waste and overflow. The Darya 6636 Freestanding Bathtub is made in the USA. Hand-built using the highest quality acrylic materials, the Darya features a 20 Year Residential Warranty*.